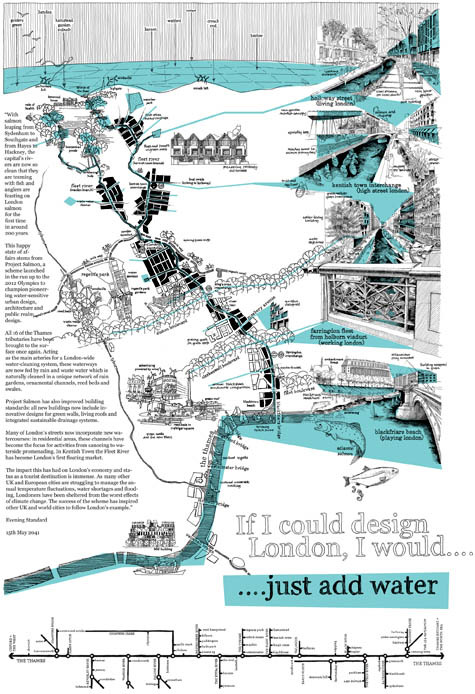 [Image: EDAW's "If I could design London, I would... just add water"; view larger!]. Having been interested in the riverine nature of London for years now – not many people realize that it's a city of canals – when I stumbled on a poster produced by EDAW for an exhibition last summer called "If I could design London I would...," I was excited enough to print it out and pin it up on my wall here at BLDGBLOG Centraal. Now that I'm moving apartments – again – and have been forced to take the poster down, I decided I should actually write something about it. [Image: A close-up of EDAW's "If I could design London, I would... just add water"]. With salmon leaping from Sydenham to Southgate and from Hayes to Hackey, the capital's rivers are now so clean that they are teeming with fish and anglers are feasting on London salmon for the first time in around 200 years. Many of London's streets now incorporate new watercourses: in residential areas, these channels have become the focus for activities from canoeing to waterside promenading. In Kentish Town the Fleet River has become London's first floating market. The impact this has had on London's economy and status as a tourist destination is immense. As many other UK and European cities are struggling to manage the annual temperature fluctuations, water shortage and flooding, Londoners have been sheltered from the worst effects of climate change. The success of the scheme has inspired other UK and world cities to follow London's example. The city's buried waterways are returned to the service; roads have becomes rivers; polluted byways are retrofitted into fishing grounds; former car parks find themselves walled off as reservoirs; canals have been reclaimed by the boats of floating markets; roundabouts are overgrown to form wetlands; and green roofs overlook it all. It's idyllic, sure, but it's no mere flight of fancy: the city is flooding, slowly but surely, over the course of coming centuries. Like it or not, in less time than now exists between us and Shakespeare, our descendants will be living in a London underwater: architects and urban designers – and, for that matter, novelists – might as well start planning now. EDAW's project, and nearly two dozen others, can still be downloaded, a year after the fact, from Building Design. i saw something on the history or discovery channel, possible 'cities of the underworld,' that investigated the complicated nature of the constant battle city engineers encounter in keeping the city from drowning. i think that's something you'd never think about most times at street level. The poster seems to be trapped in a private account at Flickr; can't find it elsewhere. Could you please provide another link? "I feel an almost savage envy on hearing that London has been flooded in my absence, while I am in the mere country. My own Battersea has been, I understand, particularly favoured as a meeting of the waters. Battersea was already, as I need hardly say, the most beautiful of human localities." This is such an exciting idea and in fact the topic of our design project this semester. I am a 5th year architecture student and passionate environmentalist so it is great to see this as a world trend. I think it's important for everyone to realise that healthy water systems make for healthy social systems too. "Mostly unrelated, just posting this interesting piece on unbuilt towers in NY from the roaring 20s."